The Human Dimension of Economic Models (H.R.H. Prince Claus of The Netherlands). A Research Agenda: Panel Discussion on Macroeconomic Models. 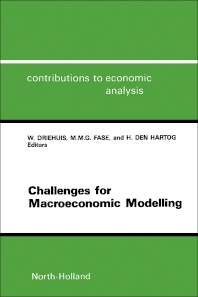 The History of Dutch Macroeconomic Modelling (1936-1986) (A.P. Barten – Comments by N. de Marchi, J.J. Polak). Macroeconomic Modelling for Economic Policy (J.C. Siebrand – Comments by W.H. Buiter, J.S. Flemming). A Comparative Analysis of Actual Dutch Macroeconomic Models (G. d'Alcantara – Comments by P.-A. Muet, H.N. Weddepohl). A Survey of Non-Dutch European Macroeconomic Models: Some International Perspective (R.G. Bodkin – Comments by K.F. Wallis, P. Richardson). Optimization and the Preparation of Economic Policy (C.J. van Eijk, F.R. Veeneklaas – Comments by L.B.M. Mennes, A. Dramais). Macroeconomic Models and Microeconomic Theory (V. Ginsburgh, J. Mercenier – Comments by P. Kooiman). Macroeconomic Models and Econometrics. (T. Kloek – Comments by F.C. Palm, J. Kmenta). Appendix. The DNB Econometric Model of The Netherlands' Economy: MORKMON (F.A.G. den Butter). The SEO Econometric Model of The Netherlands' Economy: SECMON (P.J. van den Noord). The CPB Econometric Model of The Netherlands' Economy: FREIA-KOMPAS (V.R. Okker). Name Index. This book collects the revised and edited proceedings of the conference held in honour of the 50th anniversary of Professor Tinbergen's first macroeconomic policy model. Written by experts both in the field of model building and policy analysis, the contributions provide an invaluable overview of the state of the art and the use of macroeconomic models in our time.